Serena Williams slams former tennis champ for making racist comments about her unborn baby. 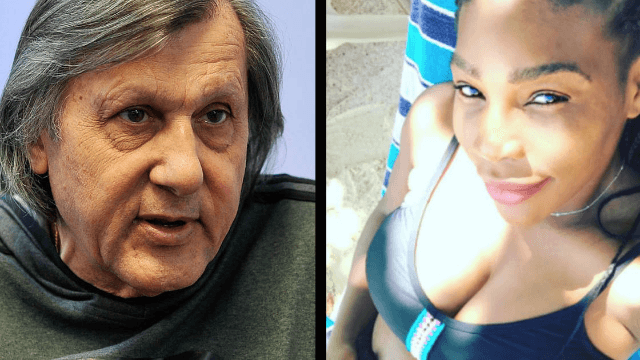 Serena Williams slammed former tennis player Ilie Nastase on Instagram after he made a racist comment her unborn child. According to ESPN, the retired tennis champion attended the Fed Cup over the weekend and said of Williams' baby, "Let's see what color it has. Chocolate with milk?" Serena Williams is black and her fiancé, Reddit co-founder Alexis Ohanian, is white. Williams posted this note to Instagram slamming the "racist and sexist" two-time Grand Slam winner (side note, Williams is a 23-time Grand Slam winner. Just sayin'). Serena Williams quoted Maya Angelou's "Still I Rise" within the classy takedown. According to the Associated Press, Nastase claimed he didn't understand the upset over his comments, and asked, "I want to know what word I used is racist?" This is not the first time Ilie Nastase has made problematic statements, and he has garnered a disgraceful reputation over the years, earning him the nickname "Nasty." And not in the Janet Jackson way. According to , Nastase randomly accused Williams of doping based off nothing but the strength of her body earlier this month. The same weekend he made racist comments about Serena William's baby, he also reportedly made British tennis player Anne Keothavong uncomfortable by asking for her room number numerous times. On Saturday, Nastase was ejected from the Fed Cup after harassing an umpire and yelling obscenities at the members of the Great Britain delegation after a tense match between Sorana Cirstea, a tennis player from his home country of Romania, and Britain's Johanna Konta. The International Tennis Federation, or ITF, is considering taking additional disciplinary action against Nastase.